Are you searching for Faculty Teachers Karnataka 2019? 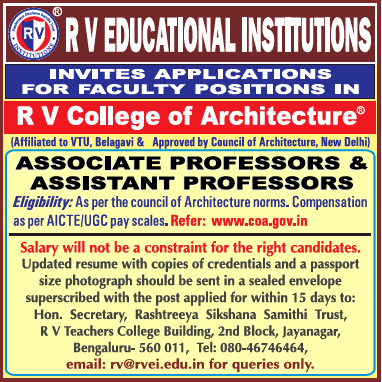 A college based in Bangalore named R V College of Architecture, Bangalore has advertised in THE TIMES OF INDIA newspaper for recruitment of Associate Professor / Assistant Professor jobs vacancies. Interested and eligible job aspirants are requested to apply within 15 days from 27th March 2019. Check out further more details below. About College : R.V. College of Architecture (RVCA), established in 1992, as Department of Architecture in R. V. College of Engineering (RVCE), Bengaluru. In 1995, the department shifted to an independent new building within the RVCE campus. The department obtained autonomy and renamed to R.V School of Architecture in 2009. Later in the same year, Council of Architecture (COA), India, approved its re-designation to R.V College of Architecture.